They are known as the Canadian Martyrs. They were a group of eight Jesuit missionaries executed between 1642 and 1649. The Jesuits worked throughout the world spreading Christianity. Like many missionaries, they were not always welcomed and, with other foreigners, they were often believed to bring death and disease. Although foreigners unwittingly carried diseases such as smallpox and flu, which indigenous people had no immunity to, such diseases were already widespread when the Martyrs settled in their Canadian regions. However, the Iroquois people considered the Jesuits to be legitimate targets and killed them. 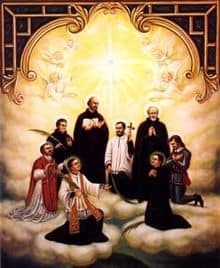 The Feast Day of the Canadian Martyrs is the 19th October. Collectively the eight martyrs are venerated as Patron Saints of Canada. Pray that we will respect all of God’s people regardless of their status, culture or disability.